Yes, that is a huge picture. Yes, that’s how good it is. I barely snapped this pic of it before it was all gone!!! I originally got this recipe from my sweet friend Cassi Wortham. We knew each other years ago in Denton, Texas, where I”m from. We were brought back together in the same city 5 years ago. God brought her and her husband Todd to Austin to plant a church, where my husband Michael and I were planting. God has taken her through so much in the past 5 years concerning adoption, church planting and grieving the unexpected and tragic loss of her husband. You’ll enjoy the reading about it all here at her blog: Live for More. I’ve adapted the original recipe into one that is perfect for our family’s taste and liking, you’ll find my variations in parenthesis. Mix the dressing ingredients together in a glass jar, shake well to mix. Mix ingredients with the dressing. Mash up the guacamole with 2 forks, pulling them against each other, continuing to stir in the ingredients that get pushed up on the sides of the bowl until guacamole becomes creamy and fluffy and wonderful! 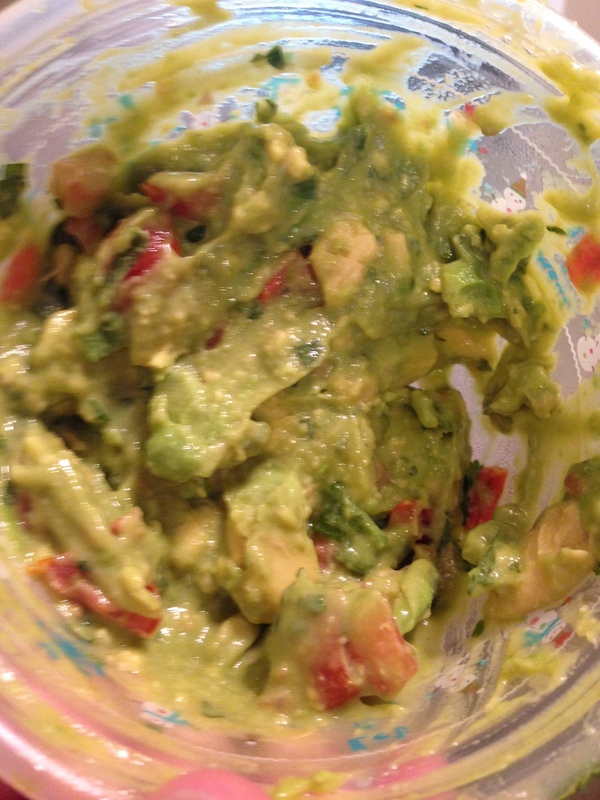 Please enjoy this guacamole recipe … our family has had about 5 years with it and have never eaten anything else!! !